Gemstones are physical tools which work with the body's own energy systems to focus, align, release, and relax. When the body is relaxed, it is more able to heal itself. When I first experienced the amazing, focused energy and power of healing crystals, I showed up one Christmas with a beautiful "box of rocks" for my family to examine! I was elated to share!! Fabulous, luscious strands of gemstones, selected not only for their beauty, but also for their therapeutic properties. 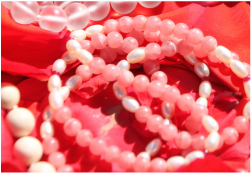 Like flower essences, each gemstone has specific attributes which when carried or worn close to the body, create balance on various energetic levels from emotional to physical. What makes these gemstones particularly effective is their unique ability to focus the body's natural energy flows. Their round shape and high quality act just like lenses. Imagine wearing glasses with flaws or "occlusions" in them... No fun at all! For this reason, I use the best quality non-treated gems I can find and pass the benefits on to you. Rocks, gems and crystals have always been a particular draw for me, so it is with great pleasure that I use them as tools in my practice. Crystals inherently contain the incredible power to focus our energy... clearing toxins, balancing chakras, tuning vibrations, pain reduction, finding direction... Crystals have boundless application. By realigning our energy, we can heal our body, mind and spirit. Contact Cici to focus your energy today!